"Porta Largo artist and crew August 1985 by Bill Witt"
An image of the sculpture Porta Largo on the campus of the University of Northern Iowa in Cedar Falls, Iowa. The sculpture by Walter Dusenberry was installed south of Strayer-Wood Theatre and Kamerick Art Building in 1985 and is an Iowa Art in State Buildings Project commission. The medium is Sardinian white marble. 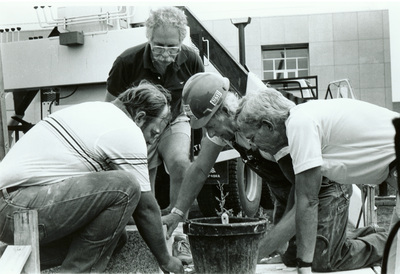 "Porta Largo artist and crew August 1985 by Bill Witt" (2019). Art on Campus Photographs. 27.